The First Communion, or First Holy Communion, is a special moment in the Christian religion and is one that will be remembered in the family forever. It's a person's first reception of the sacrament of the Holy Eucharist, and is full of so much love for the religion. Since the moment usually occurs at the age of seven to twelve, it also represents the purity of a child's soul and that soul accepting their family's religion. That's why it's so important to dress appropriately for this occasion, but it can be difficult to find that perfect outfit for seven to twelve year old girls. Traditionally, communion dresses are pure white, evoking the purity of a child's soul, just like the ceremony. 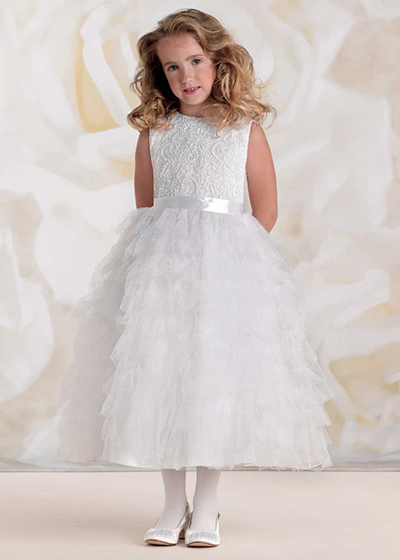 Since we know how important the First Holy Communion is to our customers, we've recently added a new section to our website for First Communion Dresses, and these dresses can even be found in our store in Linwood, NJ. All of our First Communion dresses are by Joan Calabrese for Mon Cheri. You probably know dress designer Mon Cheri from their beautiful prom and bridal dresses. Joan Calabrese is a fashion designer that specializes in children's high end clothing. Joan and Mon Cheri teamed up to bring you these gorgeous First Communion dresses that are also perfect to use as flower girl dresses for weddings. The white gowns are all classic and timeless with an edge, as well as affordable. Check out three of our favorites below, and visit our website for the rest! This entry was posted in Weddings, First Communion Dresses and tagged White Dresses, White, Wedding, wedding planning, Flower Girl, First Communion Dresses on March 29, 2016 by Chrissy Roos.